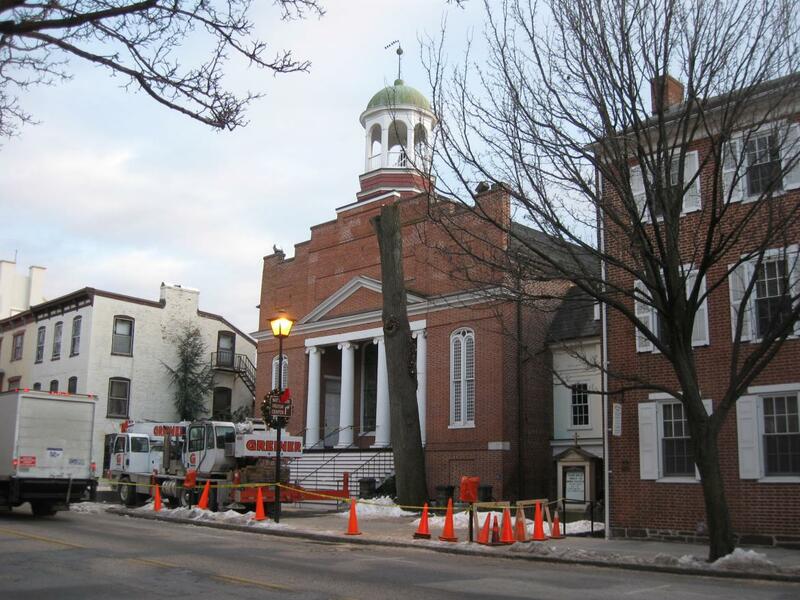 Because of safety and liability concerns, contractors for Christ Lutheran Church, on Chambersburg Street, have begun to cut down the two witness trees that stood in front of (north of) the building. This view was taken facing southeast at approximately 4:30 PM on Tuesday, January 5, 2010. 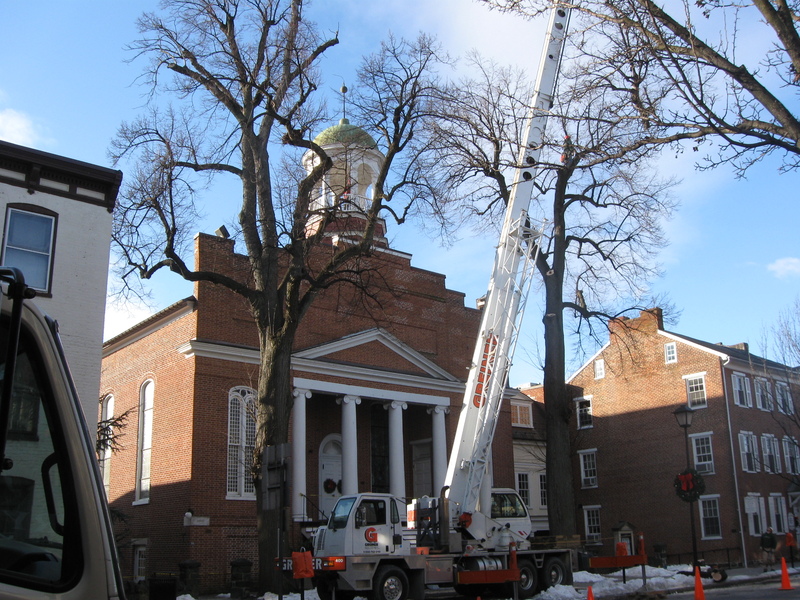 The Witness Trees at Gettysburg’s Christ Lutheran Church are being removed. 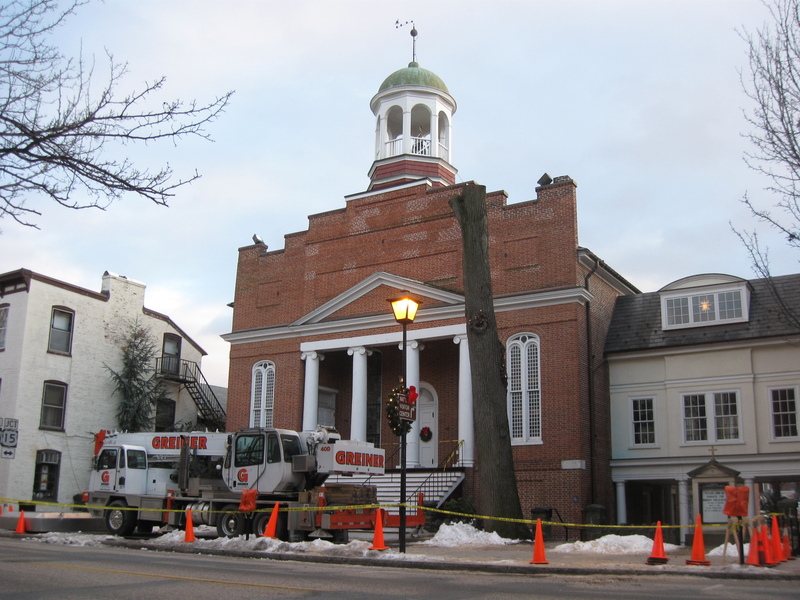 The tree on the northeast side of the church was completely removed (except for the stump) yesterday (Tuesday). 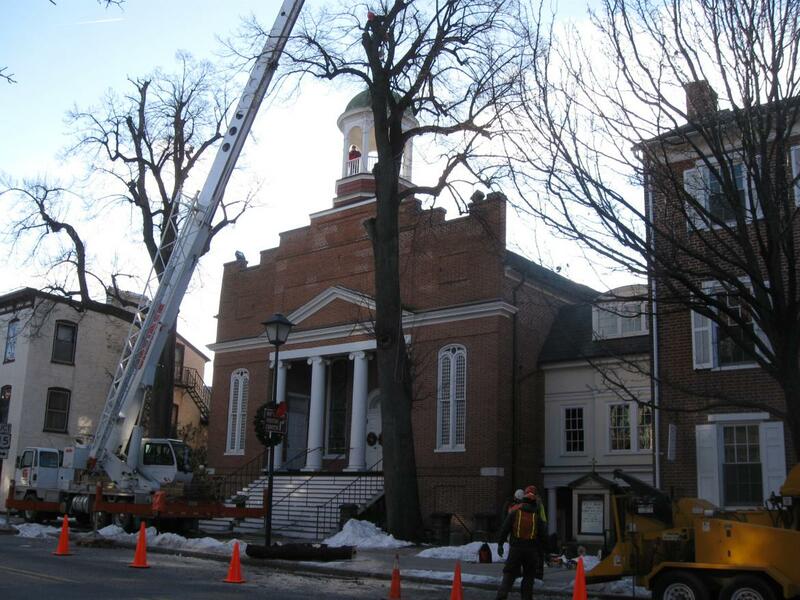 Most of the tree on the northwest side of the church was also taken down. 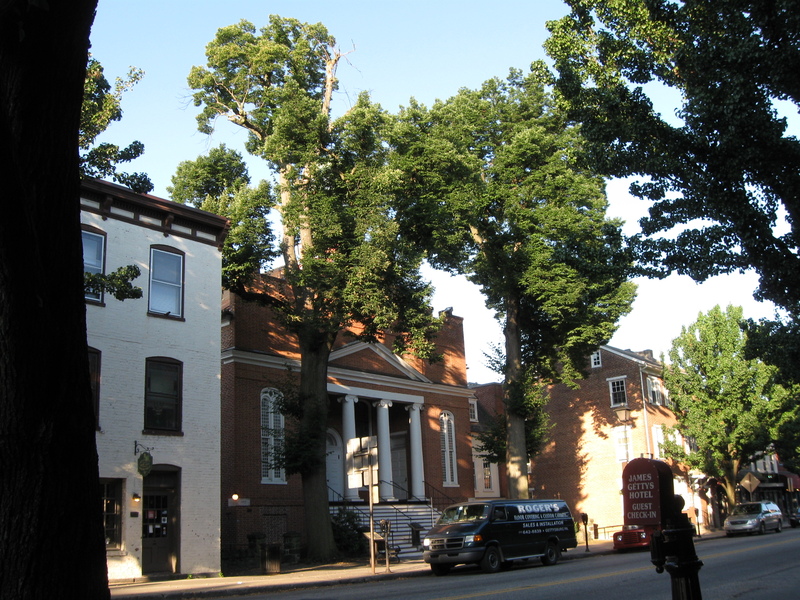 These Linden trees were approximately 170 years old. 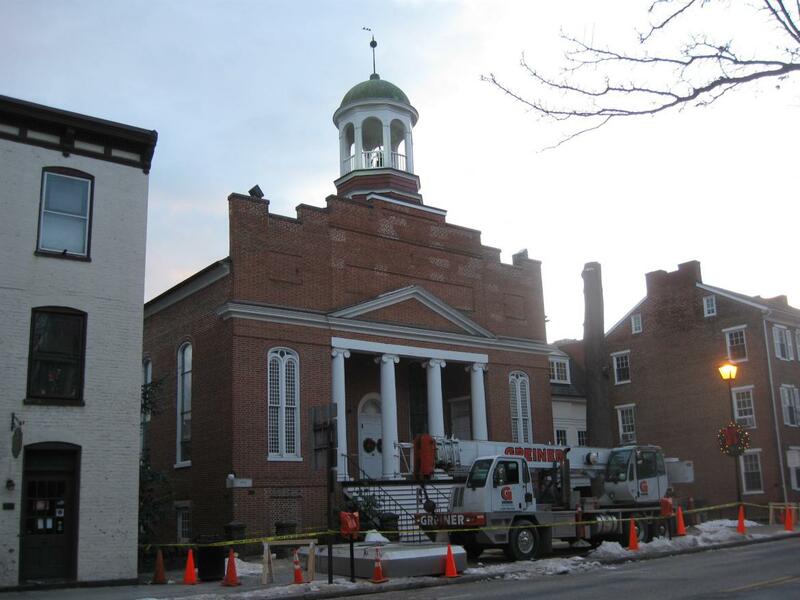 Christ Evangelical Lutheran Church is the oldest structure in Gettysburg continuously used as a Church. 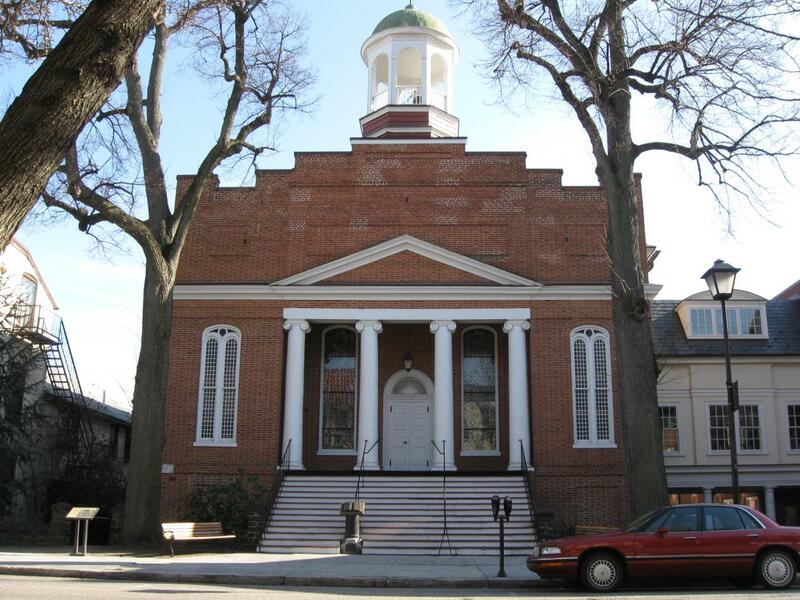 It was founded in 1835 to be the English speaking Lutheran Church in Gettysburg (St. James Lutheran Church, in existence since 1789, conducted its services in German), and to be the primary assembly hall for the Lutheran Theological Seminary and for Pennsylvania (Gettysburg) College. In our first post, Pastor Stephen R. Herr and Dr. Conrad B. Richter showed us some exterior parts of the structure and the narthex. In our second post, we saw some of the nave, or central part of the church, and we discussed the church’s roll during the battle. In our third post we looked at a picture of West Point’s Class of 1915 sitting on the steps of Christ Lutheran, observed some stained glass windows, and stood in the church area used as an operating room during and immediately following the Battle of Gettysburg. 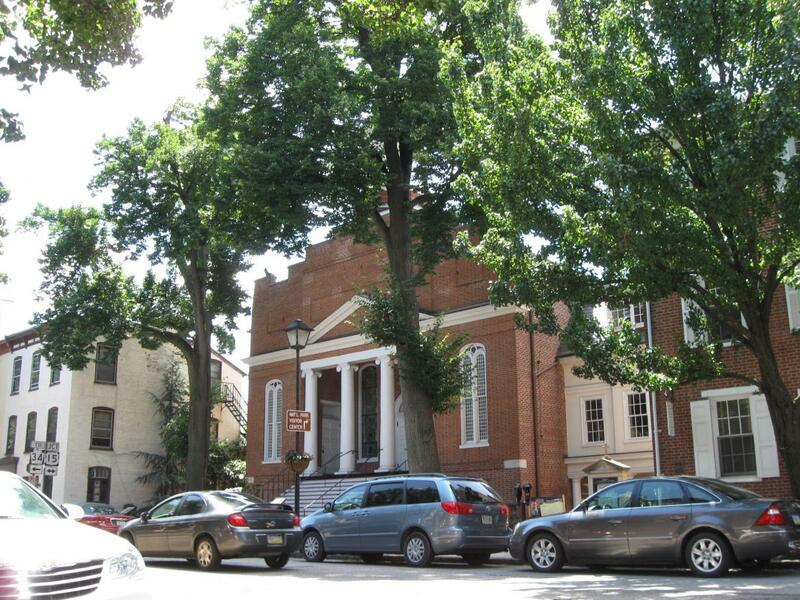 In our fourth post we learned about the church bell. 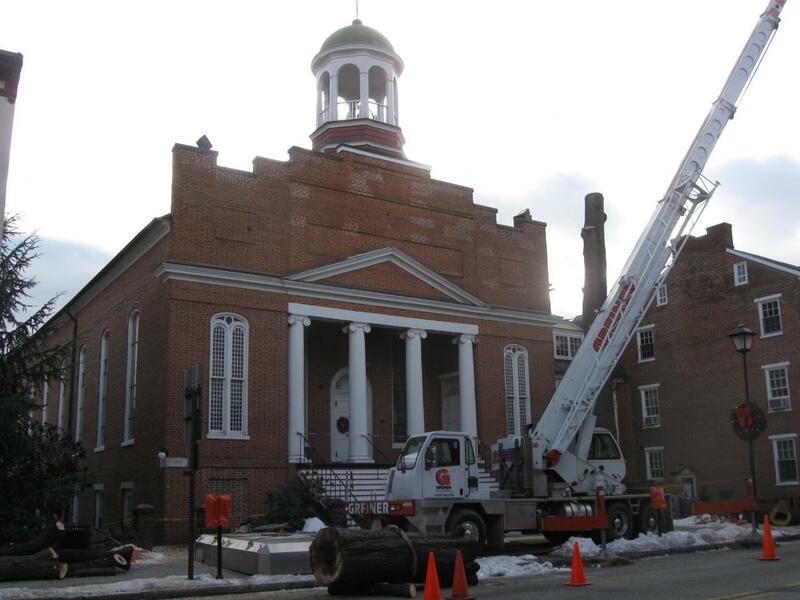 In our fifth post we showed some panoramas from the Christ Lutheran Cupola. 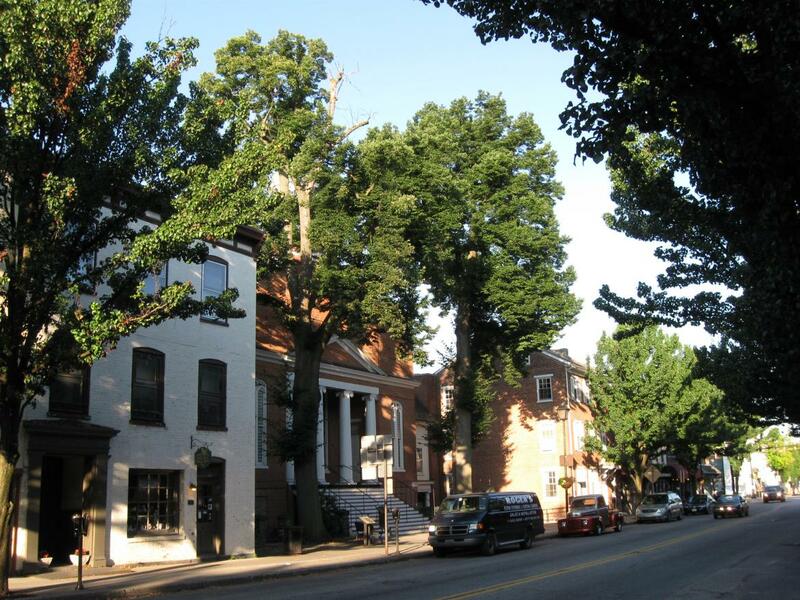 In our seventh post we wrote about the witness trees when word first reached us that they would be cut down. A similar view as our first picture, taken in July. This view was taken facing southeast at approximately 7:00 AM on Thursday, July 9, 2009. We stopped by the church three different times on Tuesday to take photographs. We’ll try to keep them as chronological as possible, except when we throw in the pictures from July to give you a contrast at what the trees looked like with their leaves. 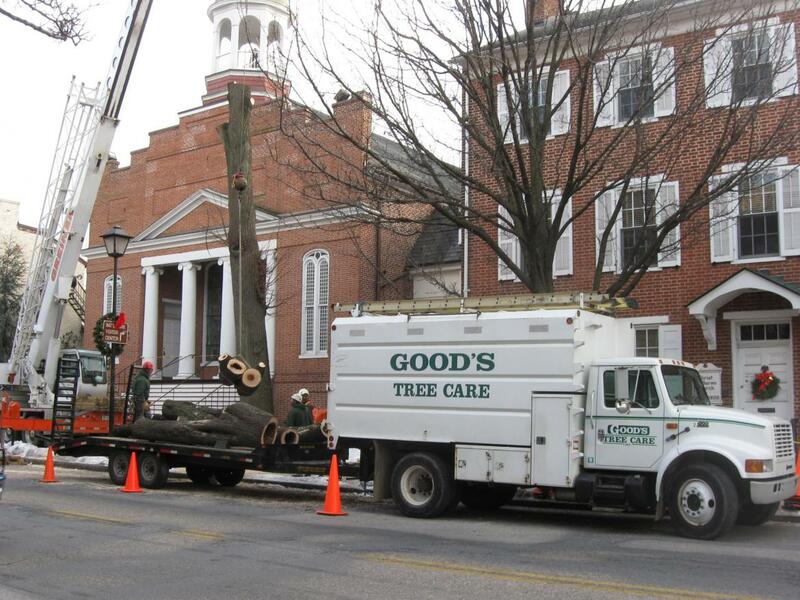 The tree removers arrived just before we did Tuesday morning. This view was taken facing southwest at approximately 9:20 AM on Tuesday, January 5, 2010. A similar view in July. This view was taken facing southwest at approximately 7:00 AM on Thursday, July 9, 2009. 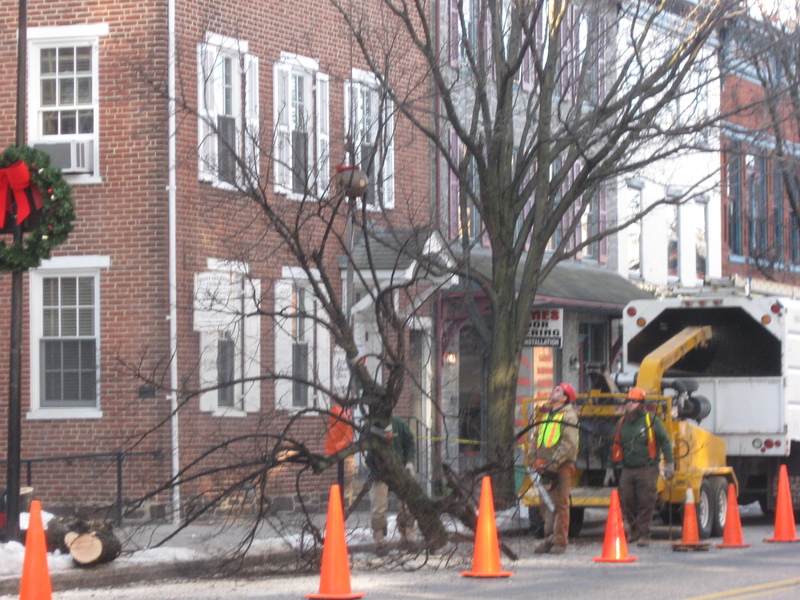 At this time on Tuesday morning, they haven’t touched the tree on the left (the east tree), but they had started to remove limbs from the tree on the right (the west tree). This view was taken facing southwest at approximately 9:20 AM on Tuesday, January 5, 2010. The crane began to lower the top of the tree to the ground by a cable. 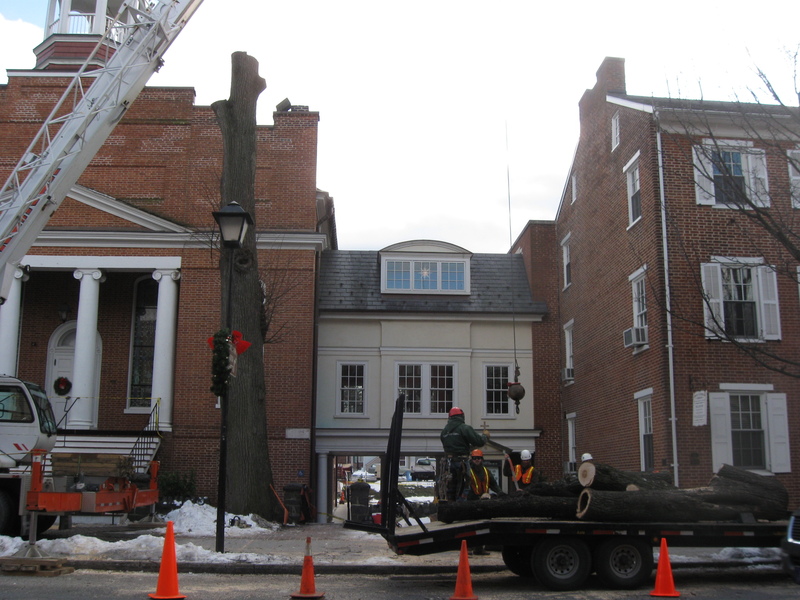 At this moment, the tree limbs being removed are above the Dr. John Lawrence Hill house and office. Dr. Hill was a Gettysburg dentist in the 1860s. This view was taken facing southwest at approximately 9:20 AM on Tuesday, January 5, 2010. The same branch on the ground. This view was taken facing southwest at approximately 9:20 AM on Tuesday, January 5, 2010. 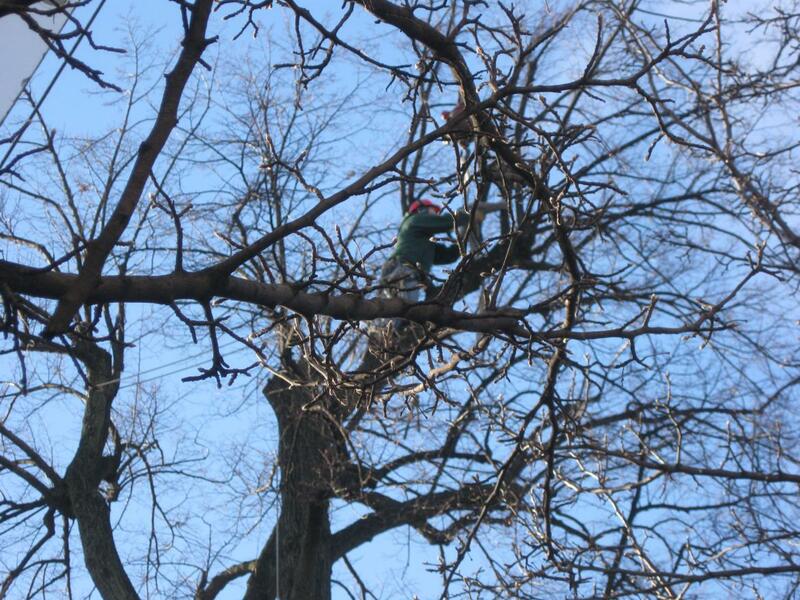 A man was placed in the tree to cut the branches. This view was taken facing southwest at approximately 9:30 AM on Tuesday, January 5, 2010. This view was taken facing southwest at approximately 9:30 AM on Tuesday, January 5, 2010. 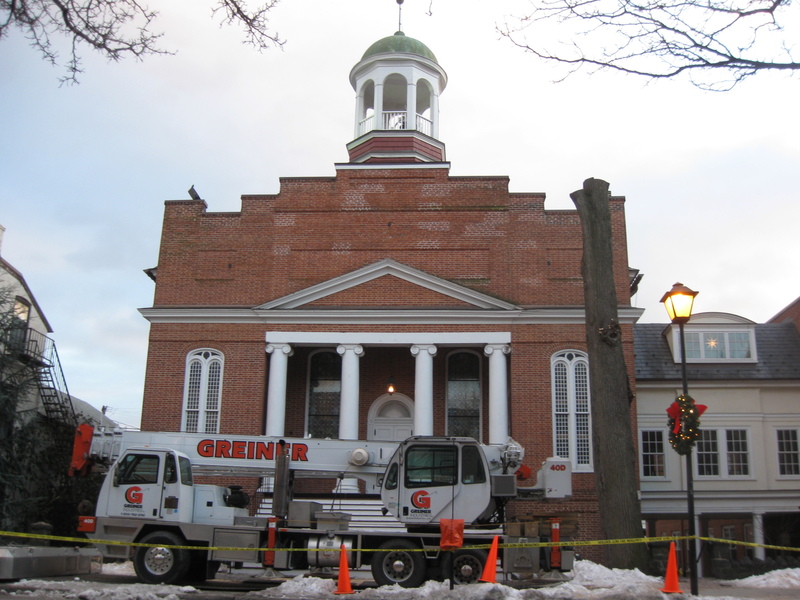 The person in the cupola wearing the red jacket was taking pictures. This view was taken facing southeast at approximately 9:30 AM on Tuesday, January 5, 2010. 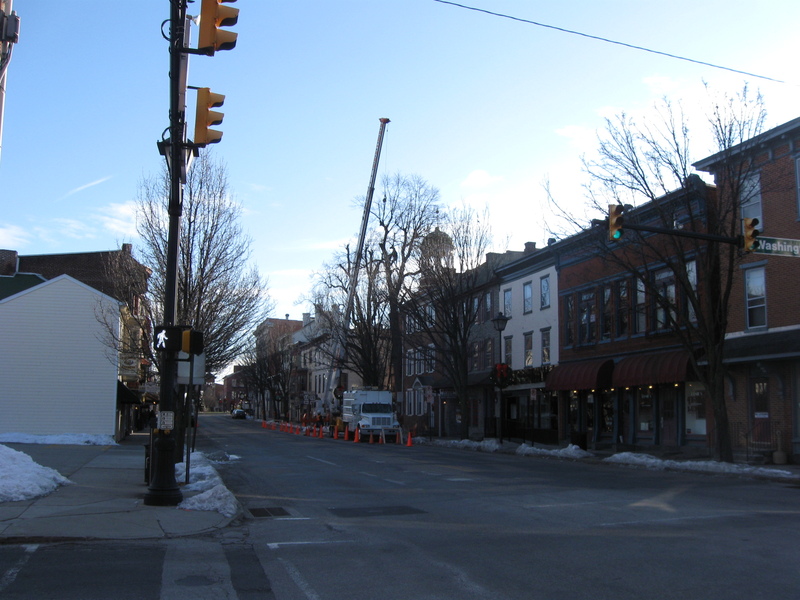 The operation seen from the intersection of Washington Street (right to left) and Chambersburg Street. This view was taken facing southeast at approximately 9:30 AM on Tuesday, January 5, 2010. 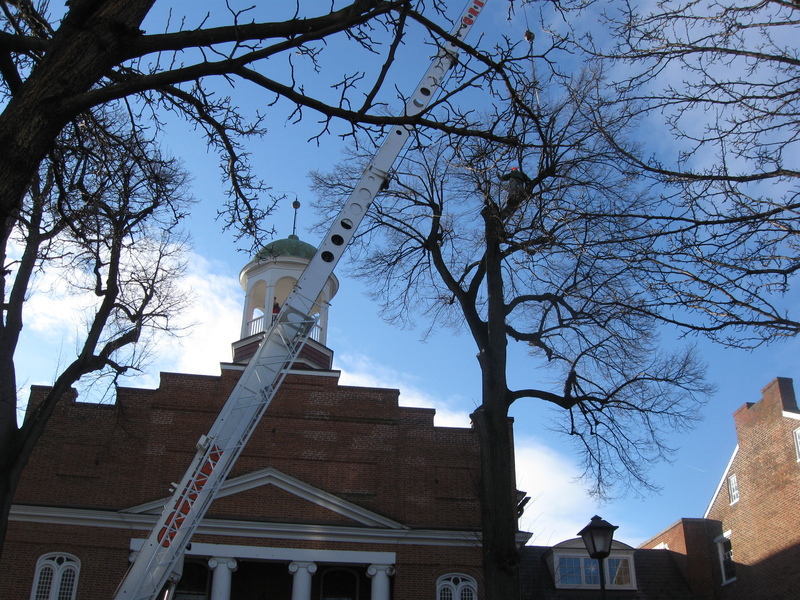 When we returned in the afternoon, the east tree had been taken down, and also much of the west tree. 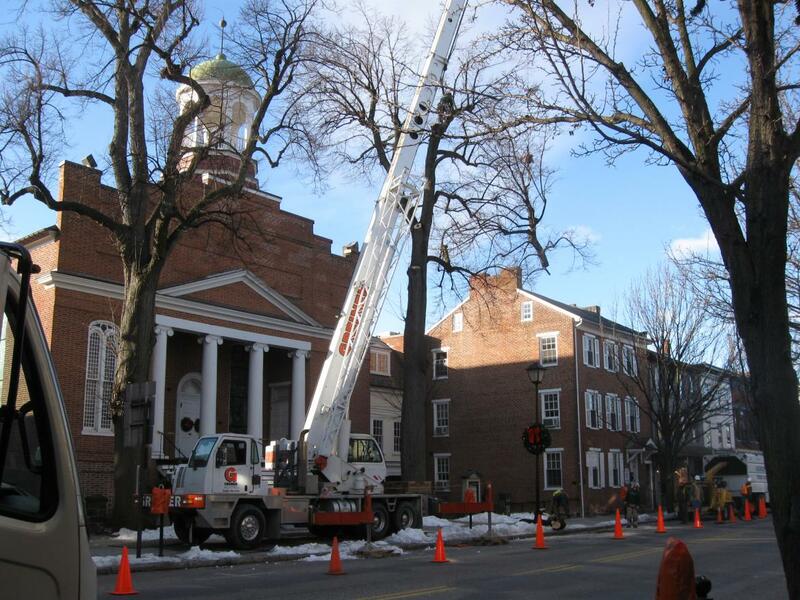 One of the controversies concerning this cutting, is did the trees really need to come down at this time. Although we tried to magnify the trunk in the foreground, we can’t really tell if its just dark, or becoming hollow. This view was taken facing southwest at approximately 2:30 PM on Tuesday, January 5, 2010. 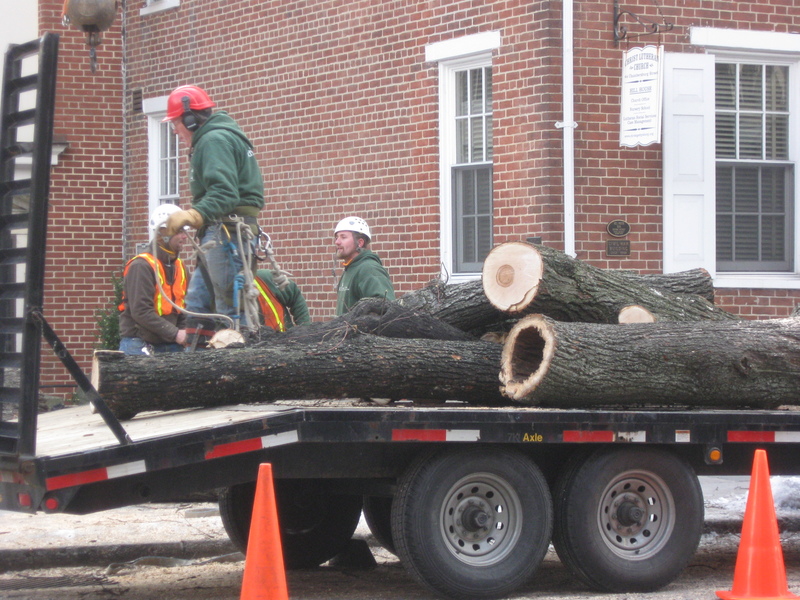 The wood on the trailer from the west tree, certainly shows that its time was up. 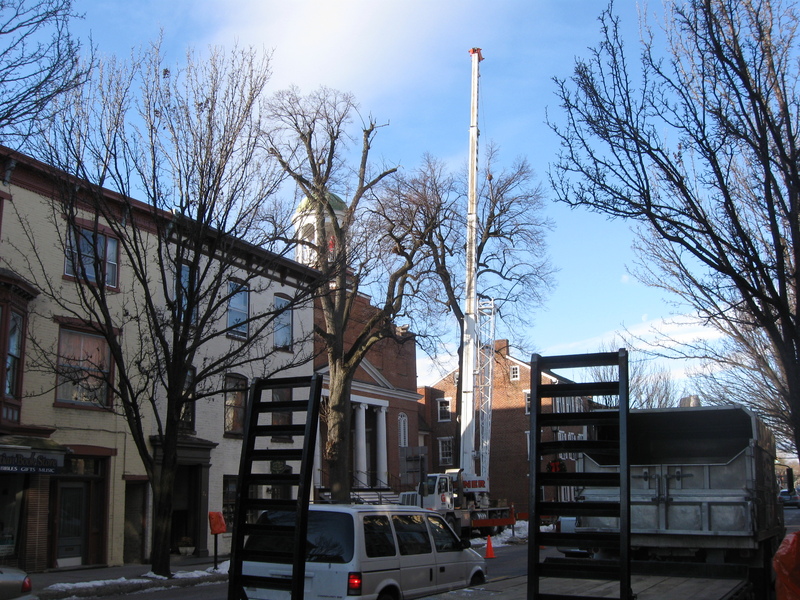 This view was taken facing south at approximately 2:30 PM on Tuesday, January 5, 2010. There is certainly a large, hollow branch here. This view was taken facing south at approximately 2:30 PM on Tuesday, January 5, 2010. And this view certainly shows that also a part of the trunk was hollow. This view was taken facing southeast at approximately 2:30 PM on Tuesday, January 5, 2010. We came back one more time a couple of hours later. This view was taken facing southwest at approximately 4:45 PM on Tuesday, January 5, 2010. This view was taken facing south at approximately 4:45 PM on Tuesday, January 5, 2010. A similar view taken last March. This view was taken facing south at approximately 5:00 on Tuesday, March 31, 2009. 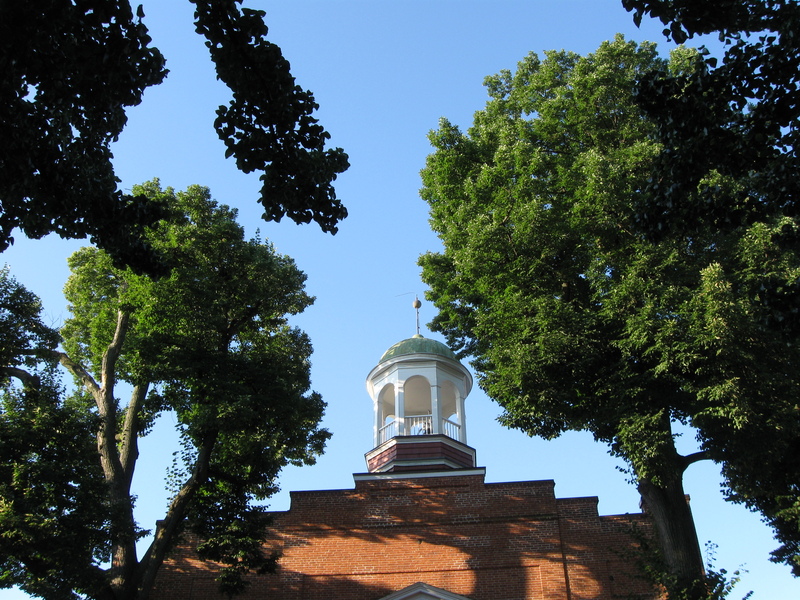 Here’s how the cupola used to look when framed by the trees. This view was taken facing south at approximately 7:00 AM on Thursday, July 9, 2009. 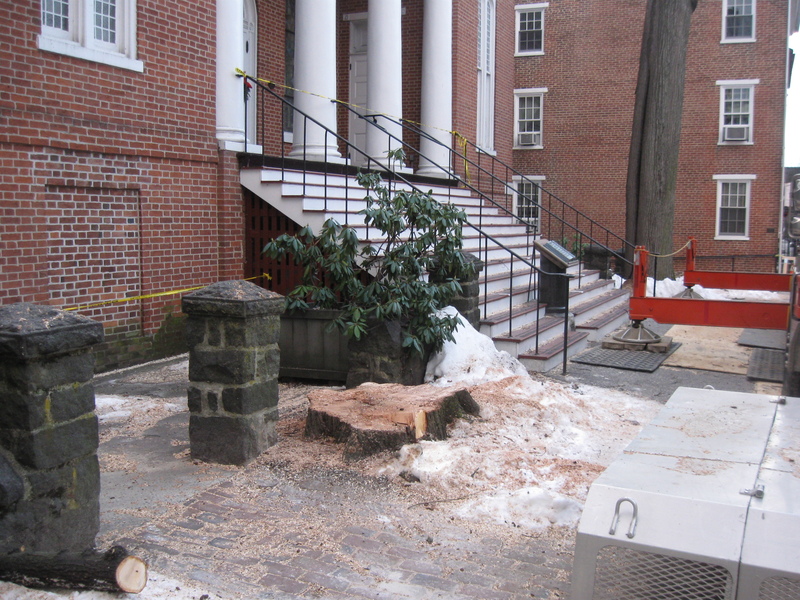 We did attempt to go as close to the stump of the “east” tree as we could without crossing the yellow safety tape. This view was taken facing southeast at approximately 4:45 PM on Tuesday, January 5, 2010. 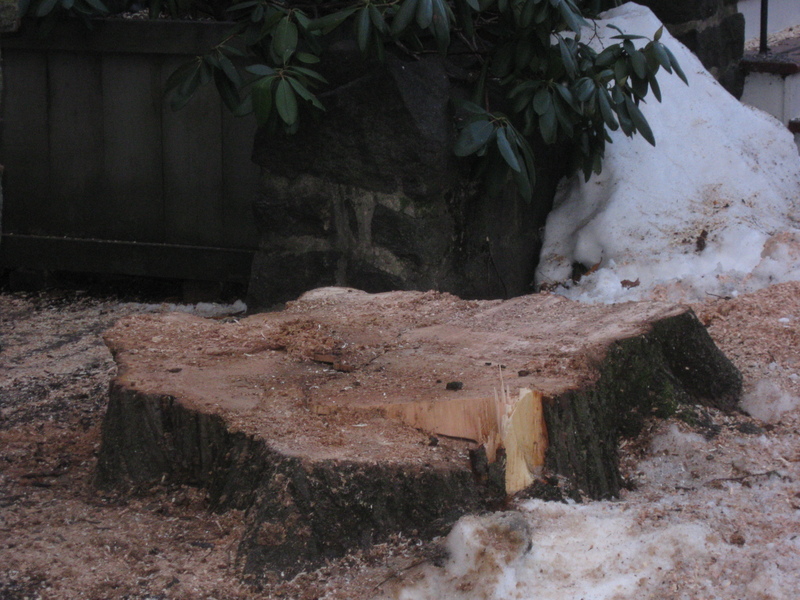 We are not tree experts, but it doesn’t look like there’s a lot of damage showing on the stump. We don’t know what the rest of the trunk of the tree looked like, however. This view was taken facing southeast at approximately 4:45 PM on Tuesday, January 5, 2010. This view was taken facing southwest at approximately 4:45 PM on Tuesday, January 5, 2010. This view was taken facing southwest at approximately 7:00 AM on Thursday, July 9, 2009.